A scheme to develop Sleaford's Bass Maltings could begin in the coming months, say project leaders. 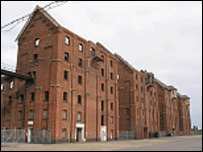 The regeneration scheme on the 100-year-old industrial complex would see it used for housing, business and entertainment purposes. Project officer Peter Bright said he hoped businesses would come forward in 2005 to begin to use the site. Malting operations at the site stopped in 1960. The buildings were then used to house chickens but are now empty. Parts of the Grade II listed building were damaged by fire in the mid 1970s. The regeneration project is being backed by the Prince of Wales's Phoenix Trust, which promotes new uses for historic buildings.